Like 48 other nail art enthusiasts, I entered Nail Polish Art Addiction's Good enough to eat contest. Please check out her post and vote (for whomever you like)! AWESOME! I luv me some Vegemite! Off to vote for you. cute what is vegemite? off to wiki.. These are so funky and creative! I really like them. :) I entered too, best of luck to you! oh these are cool! 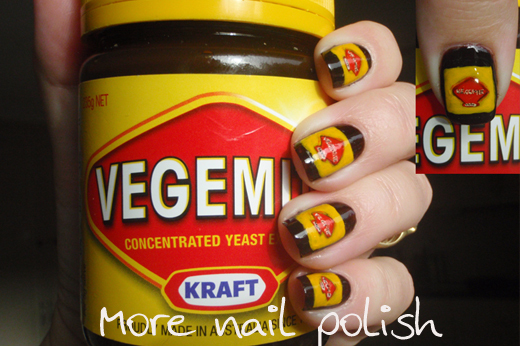 Love vegemite!! Now THAT is freakin cool!! HOW did you do this?? Are there any details ready for Australia Day? Naxi - it was all painted by hand, using different polishes and nail art brushes.